This 100% pure wool vintage Mirrors of Krizia jacket was made in Italy. It's in a light black/charcoal gray color and has a double breasted styling. 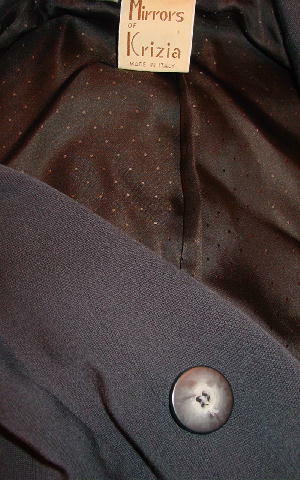 There is a very nice black 100% rayon full lining with a tone-on-tone brown dotted pattern. It has shoulder pads and long sleeves with two buttons on each. 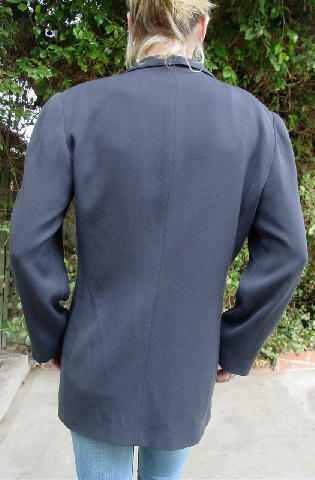 There are six multi-tone buttons down the front and one hidden one and two lower diagonal deep pockets. It has a classic styling and very nice fabric. The tag says 48 Italian. bottom hem side to side 22"